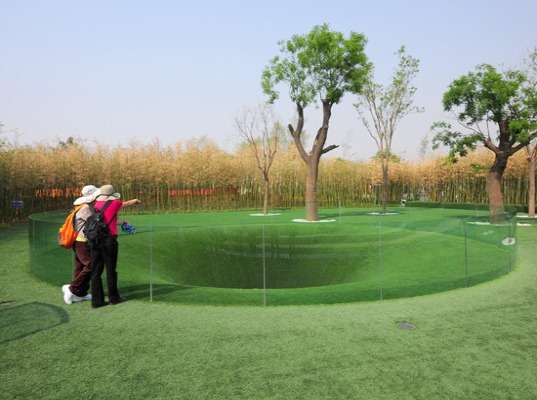 These Chinese spectators staring at “The Big Dig” exhibit at the Xi’an International Horticultural Expo are clearly wondering why there is a giant hole in the ground – and so, probably, are you. German design firm Topotek1 was asked to build a garden exhibit for the expo which they were happy to do, except instead of sticking with the same old standard two dimensional program, they dug a swirling green hole that explores what it would be like if, say, the temperatures on earth become so unbearable that people decide to dig a giant tunnel that leads all the way to China. The exhibit or hole in Xi’an is the imaginary destination – the place where subterranean travelers would arrive! We don’t often come across them, but we love speculative design projects that challenge us to imagine a world that we can’t readily see. But maybe we shouldn’t take the little blue pill too soon? These Chinese spectators staring at "The Big Dig" exhibit at the Xi'an International Horticultural Expo are clearly wondering why there is a giant hole in the ground - and so, probably, are you. German design firm Topotek1 was asked to build a garden exhibit for the expo which they were happy to do, except instead of sticking with the same old standard two dimensional program, they dug a swirling green hole that explores what it would be like if, say, the temperatures on earth become so unbearable that people decide to dig a giant tunnel that leads all the way to China. 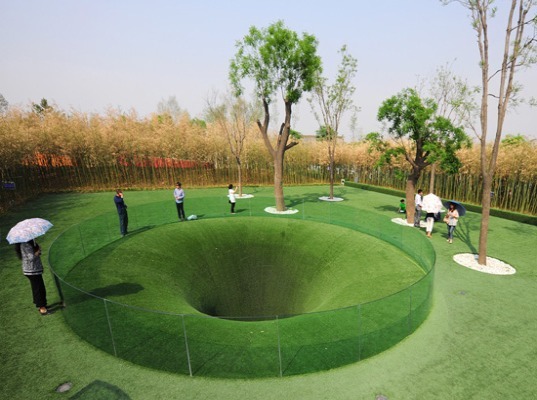 The exhibit or hole in Xi'an is the imaginary destination - the place where subterranean travelers would arrive!